Several research projects in our lab are coming to an end this fall and producing interesting results that we are now able to share. This post provides important information about the movements of Smallmouth Bass after they’ve been released at tournaments in the Bay of Quinte. 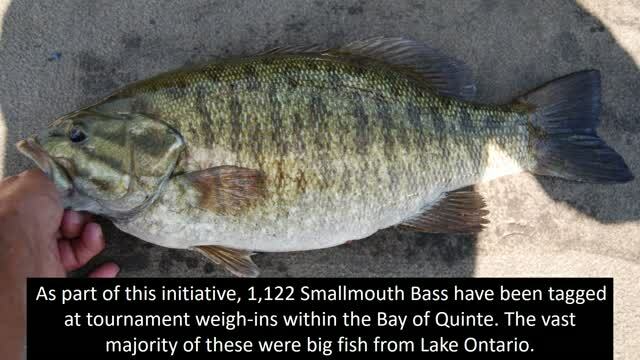 The main finding from this project (MSc thesis of Rachael Hornsby) is that most Smallmouth Bass caught in Lake Ontario and brought to the Bay of Quinte for a tournament weigh-in are not returning to the lake after they’ve been released. Since this science may have important implications for tournaments in the Bay, we thought it should be shared as soon as we were confident in our interpretation of the data. The short video associated with this post provides more details about this research. We feel that our most important job is to collect this type of scientific information and disseminate it. In our opinion, however, these results clearly have important implications for future tournaments within the Bay of Quinte. In order to minimize their impact on these valuable fisheries, organizers should consider ways to reduce or eliminate this problem. Designating future events as “Bay-Only” tournaments (restricting anglers to a distance limit such as Glenora) may be the easiest way to reduce the displacement of Smallmouth Bass from Lake Ontario into the Bay. However, there may also be other ways to solve this problem. In the coming months, we will be presenting these results in a number of different venues. We look forward to future discussions in this area, as well as any feedback on this post.